Does Valentine’s Day stress you out? Do you find yourself running around to every grocery store in Chicago, or calling every Chicago bakery on Yelp, to find the right romantic dessert for your sweetie? Well, stop it. Take 3 deep breaths, and just stop for a moment. You’re in need of a Valentine’s Day smack down – given out of love, of course! I totally understand because we’ve all been there before. With so many options and such high expectations (that we force upon ourselves), it can be challenging to know where to begin. Valentine’s Day is not about how much money you spend on the one you love. It’s not about mindlessly following the crowd to celebrate the heart-iest of holidays with the masses. In the same way each relationship is unique, the way you honor your significant other and the way you celebrate Valentine’s Day together should reflect the uniqueness of the relationship you share. I don’t like crowds, so spending Valentine’s Day with the rest of Chicago crammed inside a busy restaurant can cause a panic attack. For me, nothing speaks louder than thoughtful actions…like a quiet, home-cooked meal that reflects a shared experience. One easy way to create a Valentine’s Day menu is to build it around a theme like your favorite destination as a couple. Personally, I adore Chicago; that’s why I live here. But Paris is hands-down the most romantic city I’ve ever experienced. There is literally romance in the air throughout the City of Lights. So for Valentine’s Day this year, I want to bring a bit of Paris into my home. Mariano’s makes that easy to do. 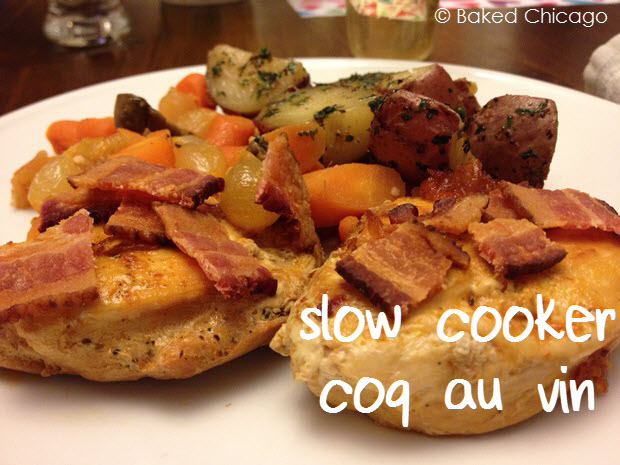 I’m going to make a slow cooker coq au vin recipe for dinner using fresh poultry and produce from #MyMarianos. And with my Mariano’s Rewards Card in hand, I’ll supplement everything else (including flowers and wine) that I need for a romantic Valentine’s Day breakfast and dinner at home with items from the Mariano’s Bakery, Deli, International Market, Liquor and Floral departments. And don’t forget the butter! French cuisine focuses on simple, high-quality ingredients. If you’re going to have croissants made with real butter, then enjoy real butter ON them as well. Warm the croissants before serving, and consider having breakfast in bed for an indulgent start to Valentine’s Day. Oui, oui! 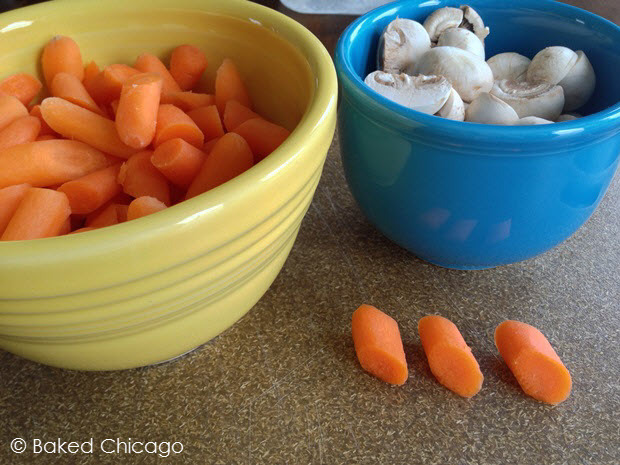 Most of the slow cooker coq au vin ingredients I purchased on this #CollectiveBias #shop at Mariano’s were already fully prepped, except for the carrots. To give your carrots a bit of sophistication (yes, carrots can have sophistication! ), cut them on the diagonal. It’s a simple trick that makes them look a bit more special. 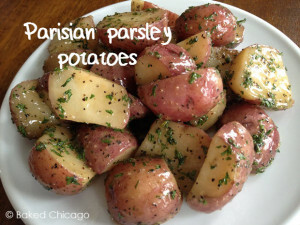 A traditional side dish served with slow cooker coq au vin would be Parisian Parsley Potatoes. This recipe takes about 30 minutes to cook and it continues the buttery decadence that Parisian food embraces. A definite must to add to your Valentine’s Day menu. Coq au vin would normally use a Burgundy (red) wine but this recipe uses a white wine. There are variations of coq au vin that also use champagne. Use whichever you prefer. My suggestion is to buy 2 bottles of your favorite wine. Pour one cup into the slow cooker (that’s all it takes) when you’re ready to start cooking and save the rest for your dinner. My Valentine’s Day menu is obviously inspired by Paris. But maybe another global destination holds a more romantic meaning for you and yours. Did you honeymoon in Italy or meet the love of your life in the Mediterranean? Mariano’s Bakery (my favorite department within the store!) has hand-made Italian cookies, biscotti and cannoli. And across the aisle at Mariano’s Deli you’ll find big, beautiful Greek olives and a variety of Mediterranean salads. The point is to fill your Valentine’s Day menu with items that have meaning for you. Still need some inspiration? 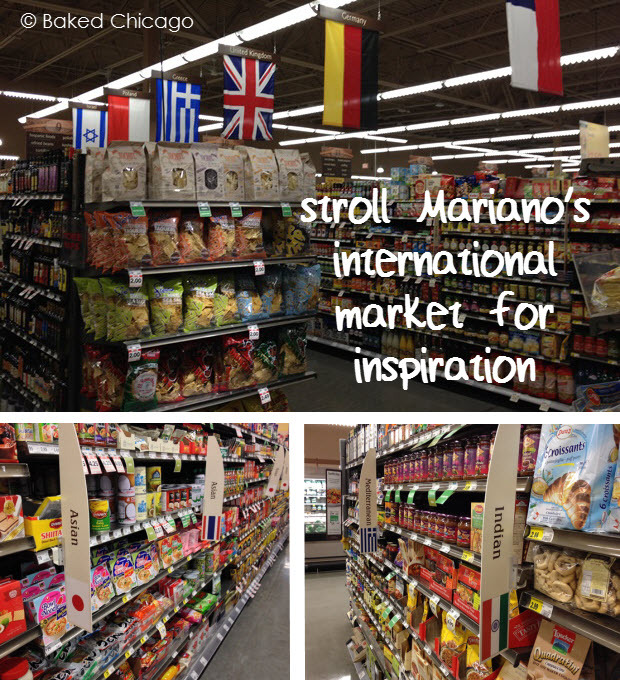 Just take a stroll in Mariano’s International Market aisles. 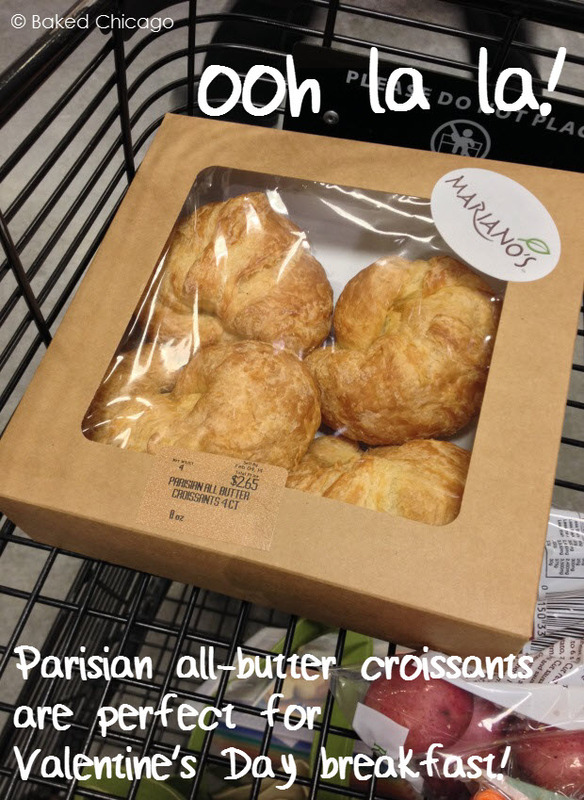 Mariano’s has items from Italian, Hispanic, Asian, Polish, Kosher, Indian, Mediterranean, German, Eastern European, British and Southern cuisines. It’s the supermarket version of around the world in 80 plates! And any of these global goodies would be a perfect match for your Valentine’s Day menu. If you know what kind of cuisine you want to prepare but you don’t know what wine or cheese to pair and serve, Mariano’s has a team of people who are ready with suggestions. They even have a Wine & Cheese pairings area in the store to kick-start your brainstorming. Ideas and inspiration are plentiful at Mariano’s; that’s one of the reasons why I enjoy shopping there so much. It’s not just a grocery store. For foodies, it’s like an adventure theme park filled with all kinds of deliciousness. And when I’m not inside my local Mariano’s store, I stay connected to get ideas by following #MyMarianos on social media, including Facebook, Twitter and Pinterest. 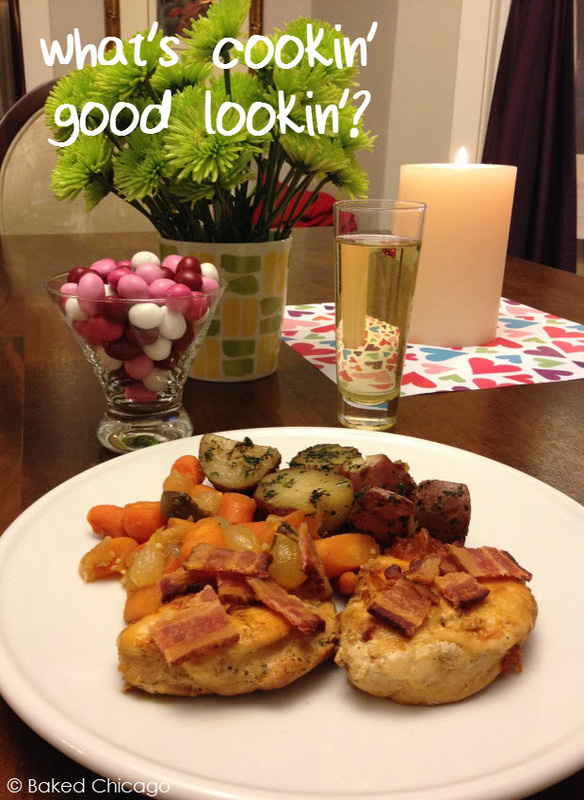 What are you planning for your Valentine’s Day menu? Or if the proverbial oven mitt were on your significant other’s other hand, what dish would you want them to be making just for you? In a 5- to 6-quart slow cooker, combine the mushrooms and pearl onions. Set aside. Lightly season the chicken breasts (both sides) with salt and pepper. In a large nonstick skillet, heat the olive oil on medium high. Cook the chicken over medium-high heat until browned (about 10 minutes on each side). Place chicken over the vegetables in the slow cooker. Using the skillet with the remaining drippings, add the chopped onion and sliced carrots. On medium heat, cook for 3 minutes or until the onion softens and becomes translucent. Stir frequently. Stir in the garlic and cook for 1 minute. Add the wine, tomato paste and bay leaf. Heat to boiling, stirring to dissolve the tomato paste. Pour the wine mixture, followed by the chicken broth, over the chicken breasts in the slow cooker. Cover the slow cooker and cook on low for 8 hours. About 15 minutes before you’re ready to plate, cook the bacon in the microwave using a microwave-safe plate. Put 8 paper towel sheets on the plate and top with the bacon slices. I recommend cutting the bacon AFTER the cooking process. Put 4 paper towel sheets on top of the bacon slices and cook, following manufacturer’s directions. For my microwave, 4 slices of thick-cut bacon will cook in 5 to 6 minutes. Cook until crispy, then cut into 1-inch pieces. Remove the bay leaf from the slow cooker. Transfer the chicken, vegetables and sauce to a deep serving platter or plate immediately on individual plates. Sprinkle each serving with bacon and enjoy. Let this cook during the day while you’re at work. But if you need to whip it up faster, you can cook it on HIGH for 3 to 4 hours.